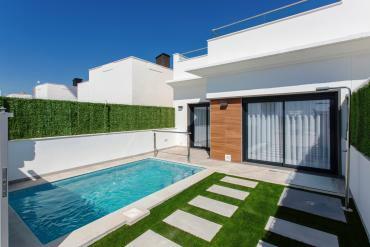 The best thing about living on the Costa Calida is that its residents enjoy a fabulous annual climate. If you are looking for a city where you can enjoy the heat, without having to leave your house, we offer Los Alcazares villas with private pool for sale. 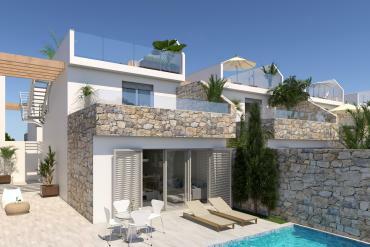 This property model is an exclusive type offered by Casas Espania. 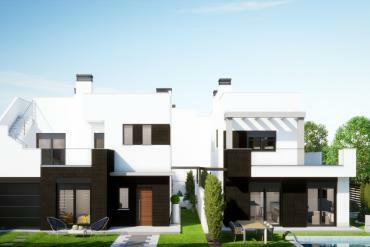 Our villas for sale are modern and built with high quality materials. Our real estate agency in the Costa Calida is not only characterized by offering high quality properties, but also by providing the client with the best advice for their welfare in Spain. If you choose Los Alcazares villas with private pools for sale as your holiday destination or long period of rest, our professionals will help you throughout the sales process. Our advice will help you enjoy a previous dream period. 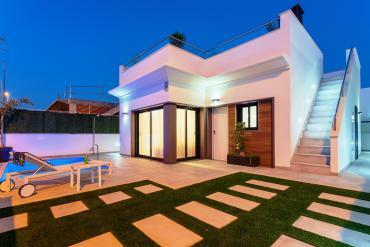 Our main objective is that the client remember forever the entire course until its adaptation in his new home. Similarly, we work to keep the customer at all times calm. We transform your investment into satisfaction. 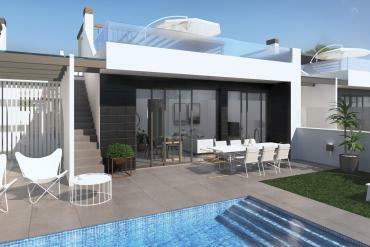 With a villa with a private pool in Los Alcazares, all are advantages. 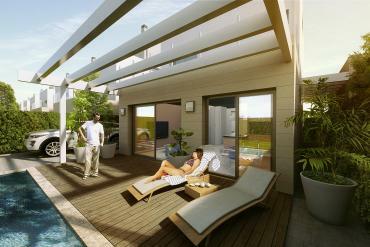 You can enjoy the qualities of the Costa Calida, inside and outside your home. Many of our villas are located a few steps from the beach, so you can opt for a salt water bath, instead of fresh water. Its beaches, by the way, are beautiful. They are composed of soft sand and crystal clear sea. A place of international tourist interest. Are you a lover of Mediterranean cuisine? In Los Alcazares you will have the opportunity to taste all the food and typical dishes of Spanish Mediterranean cuisine. If you like to eat or dine out, Los Alcazares offers incredible restaurants located on the beachfront. If you intend to look for a property to find the maximum pleasure and rest, choose Los Alcazares villas with private pool for sale. 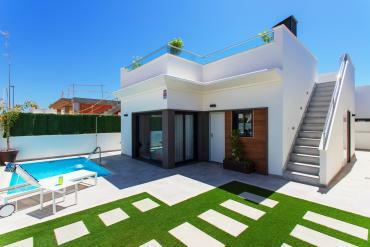 If you come to meet us in person, we will offer you all the details of our villas. We are located at 102 Avenida de la Libertad, Los Alcázares, Murcia, Spain.